Visit YIA Gallery this summer to see work from Laurel Dell 4th graders who were part of Youth in Arts “Architects in Schools” program. 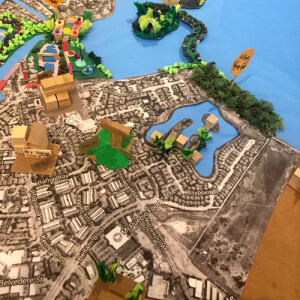 Mentor Artist architects Rich Storek & Shirl Buss led students in investigating their community, learning about architecture and designing their own projects, as well as considering their personal connection to their built environment. This exhibit includes children’s creations from the 2017-18 year, along with photos and video sharing more about the program and hands-on architecture activities for all ages. Learn more about the Architects in Schools program and see a short video here.